In my life in security I try to monitor several topics. Two topics I'm often checking -- usually through Google News Alerts -- are cyberwarfare and cyberterrorism. This week I came across an excellent summary report from the Congressional Research Service on this very topic. 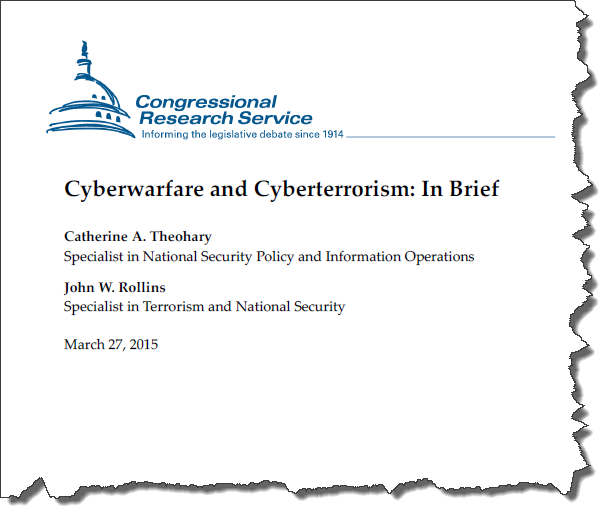 This 12-page summary document is an excellent overview of these topics and also provides some comparisons between cyberterrorism, cybercrime, cyberespionage, cyberwarfare, and cybervandalism. A high level view of the key headings in the document (below) will give you a view of the document and its contents. Overall, this is an excellent and fairly rapid read on this contemporary subject and I'd recommend it be viewed by students, policy makers and all cybersecurity professionals.